The cover art for Hardwired... To Self-Destruct. Not Greg, Fidelman, obviously. Fidelman is one of the founding members of Van Nuys band Rhino Bucket. He played lead guitar for the band between 1986 and 1996, and is credited on the albums Rhino Bucket, Get Used To It and Pain as Greg Fields. The 50-year-old is the fifth producer to work with Metallica. Paul Curio produced the band’s debut Kill ‘Em All in 1983. Flemming Rasmussen produced the following three albums: Ride The Lightning, Master of Puppets and …And Justice For All. Bob Rock took over for their 1991 self-titled album, Load, Re-Load and St. Anger. Rick Rubin manned the production desk for their 2008 album Death Magnetic. It’s not the first time Fidelman has worked with the band. 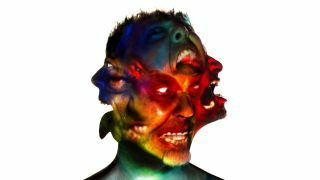 He worked as an engineer and mixer on Death Magnetic and co-producer, engineer and mixer on Lulu, the band’s collaboration with the late Lou Reed. He also oversaw the band’s live soundtrack to their first-ever feature film Through The Never and is also credited as a producer on the actual film. His first gig as an engineer was on Sick Of It All’s 1997 album Built To Last. He engineered System Of A Down’s self-titled debut album in 1998, and his most recent producing credit was for Slipknot’s 2014 album .5: The Gray Chapter. Fidelman also engineered and mixed Slipknot’s 2004 album Vol. 3: (The Subliminal Verses). Corey Taylor described him as the “unsung hero” of the Rubin-produced album. “If it wasn’t for him and us, that album would not have sounded the way it does,” Taylor told Noisey. He also engineered and mixed Adele’s Grammy Award-winning album 21 which was released in 2011.